I should be cleaning my craft room, but I wanted to share a card I made yesterday, during an inspirational moment, while cleaning house! I haven't played with my BossKut Gazelle (personal die cut machine) in awhile. I love the machine, I use it mostly when scrapbooking. Lately I've been in card mode. Getting back on track....I used the Gazelle to cut the background shapes on my card. Then I covered them with Ghosts....now how smart was that? It does give depth to the card. 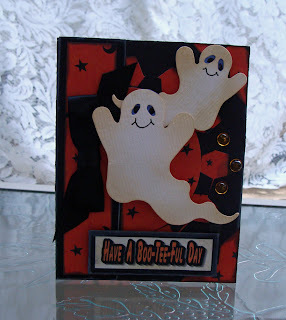 The Ghosts are a Sizzix die that I added some Tim Holtz Distress Ink - Antique linen to the edges. 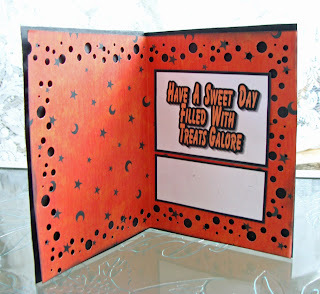 "Have A Boo-Tee-Ful Day was created on my computer, using the PrintShop 22 Program. The shinnies are Dew Drops and the ribbon....is a silk ribbon that I tied using my Bow Easy (I'm not the best at tying a bow - especially the small ones). I chalked the edges using Color Box Fluid chalk in charcoal and alabaster. The decorative paper used inside and out is from the new Debbie Mumm Harvest and Holiday collection. I, again, printed the inside sentiment using the PrintShop 22 Program. I punched the edges with the EK Success Swiss Cheese border punch....becoming a favorite of mine...Thank you Carolyn for introducing me to this punch. Off I go. Have a wonderful Sunday.